This post is sponsored by hhgregg, all opinions and ideas are my own. We've been having lots of fun coming up with a few new lunch ideas for this year, along with reworking some of our old favorites. With the move, we reorganized the bento cabinet and found a few things that had gone missing over the four years in Colorado. 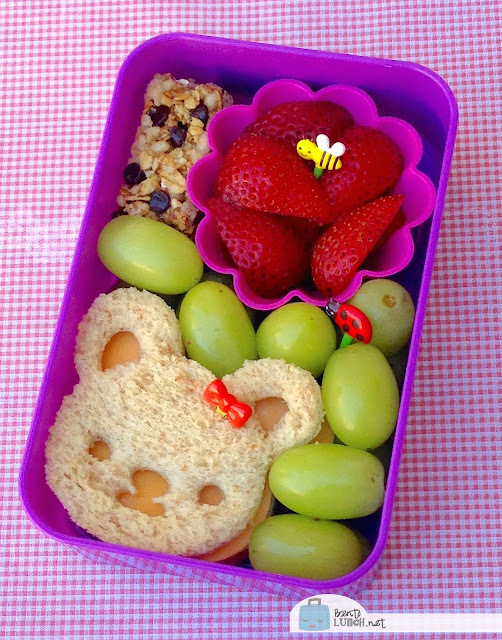 We've added some fun new tools and we're all set for another year of lunches. Today, we've got two new ones to show you and some tips on how to recreate them for your kids. Everyone loves a teddy bear, so why not a teddy bear sandwich? Lunch consists of a turkey and cheese sandwich, cut into a teddy bear shape using one of our Cutczcute sandwich cutters, grapes, strawberries, and a granola bar. 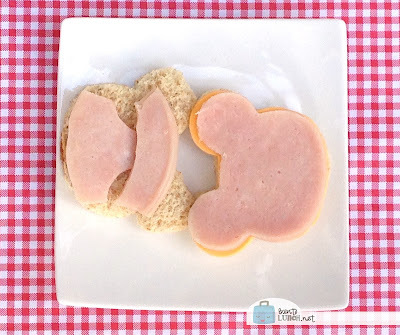 Would you like a trick to making these sandwiches? Cut each ingredient separately. If you make the sandwich, then cut it out, the bread often tears from the thickness. But cut the bread, the meat, and the cheese separately, and assemble it for a perfect fit. And since one of the concerns about sandwich cutters is the waste, just cut the extra meat or cheese and tuck it inside the sandwich like we do. After we made the sandwich, I sliced the strawberries and tucked them into a silicone muffin cup so they didn't leak onto the other food. I placed those items as far from each other in our box, just in case. I cut the granola bar was cut into two small pieces so it could help keep the strawberry cup from moving, then packed grapes in all the open areas to make sure the food didn't shift while carrying. Our second lunch is a favorite style with a new recipe. While we were out and about the other week, they were giving out samples of a chicken salad, mixed with hummus instead of mayo. Faith and I feel in love with it and immediately, it was an "I can make that" moment. So in honor of our new discovery, this lunch has chicken salad and crackers mix. The chicken salad is tucked into one of our jumbo silicone cups, since those touch the lid of the box and don't move or spill. I added crackers to go with it, but it could make a great sandwich too. 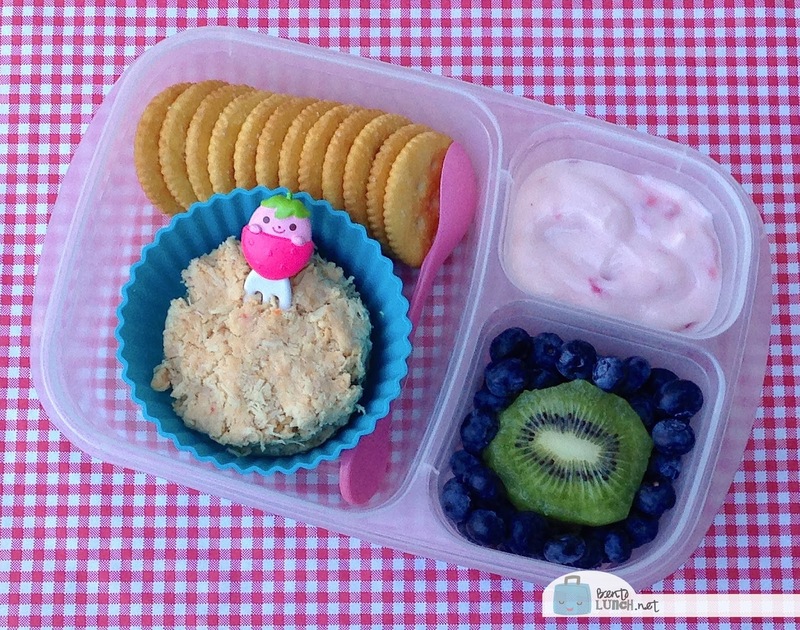 Sliced kiwi and blueberries filled our fruit compartment and strawberry yogurt rounds out the meal. Drain the canned chicken and rinse it with fresh water, press through a strainer to remove excess liquid. Add chicken in small batches into a mini chopper to finely chop/shred. We like the chicken very small. Place chicken in a bowl and mix well with roasted red pepper hummus. Optional - add in a little mayonnaise to make it more "spreadable". Serve with crackers. We also love it with pita chips, mini toasts, pretzels, and mini croissants. Are you ready for back to school yet or has school started where you live? In Washington, we're still on the last week of summer vacation, so the kids are outside most days, soaking in the sunshine (it's been really nice since we got here, with minimal rain). We're living in a family-friendly neighborhood, so there are always kids to play with, it's like recess all day long! What was your favorite recess game as a kid? I remember jumping rope, playing 4-square or basketball, depending on the age, and rolling down the one hill at the back of our school! The little town we live in now is conducive to this kind of play and I love seeing my kids out there having the 1970s/1980s childhood. The fun quiz above will tell you what recess game you are! In case you wanted to know, I am Duck Duck Goose! Leave me a comment telling me yours too, I can't wait to see what the other options are! I love the chicken with hummus salad idea! I've doctored hummus with lots of things but not chicken yet. I bet that's really yummy. It's really good. I want to try it with other hummus flavors now! Thanks! We ended up in Dupont, close to JBLM. The kids are excited about the fair!